The dynamic collage “Shown and Told” brings fixed material and possibilities of free play into harmony. 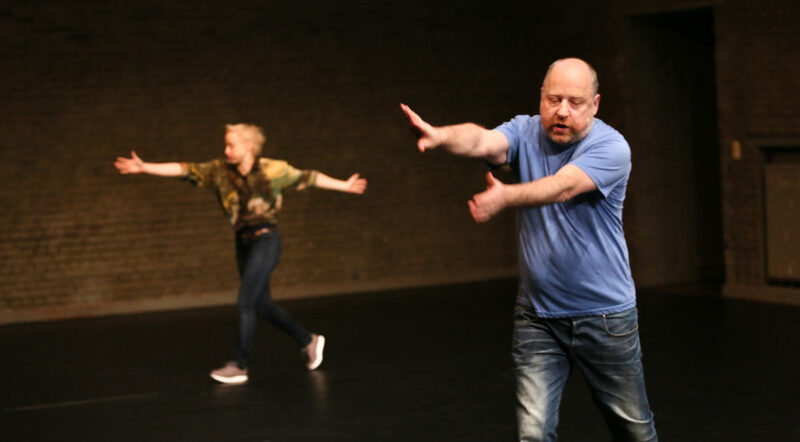 Meg Stuart and Tim Etchells develop a dialogue in which their different practices and artistic sensibilities emerge, while at the same time exploring the relationship between movement, image and body. In penetrating and surprising metaphors – physical as well as linguistic – the two performers* enter into an exchange that is sometimes brutal and sometimes touching or full of comedy. Meg Stuart, born 1965 in New Orleans (USA), is a dancer and a world-renowned choreographer. In 2018 she was awarded the Golden Lion at the Venice Biennale for her life’s work and the German Dance Prize for outstanding performers. This was in recognition of her outstanding role in the development of contemporary dance. The Kulturstiftung des Bundes was able to win Meg Stuart as artistic director for the triennial dance congress, which will be held in Dresden in 2019. Meg Stuart lives and works in Berlin and Brussels. Tim Etchells is an artist and a writer based in the UK whose work shifts between visual art, performance and fiction. He has worked in a wide variety of contexts, notably as the leader of the world-renowned Sheffield-based performance group Forced Entertainment. Recent publications include “Vacuum Days” (Storythings, 2012) and “While You Are With Us Here Tonight” (LADA, 2013). He is currently Professor of Performance & Writing at Lancaster University. Before “Shown and Told”, Etchells and Stuart already collaborated on “Alibi” (2001), “It’s not funny” (2006), “All Together Now” (2008) and the video installation “I thought I’d never say this” (2008). Meg Stuart & Damaged Goods are supported by the Government of Flanders and the Flemish Community Commission.